Saturday Night Live co-head writer Bryan Tucker, in conjunction with Above Average, launched a sports-themed comedy website called The Kicker this week. “We thought the world needed another website,” Tucker explains. The site’s goal is to provide daily comedic content for sports fans, all with a light, irreverent tone and since Saturday Night Live has actually done a memorable bit or two about kickers over the years, the name is highly appropriate. “We’re not here for analysis or commentary,” says the site’s introductory note. “There’s enough of that out there. 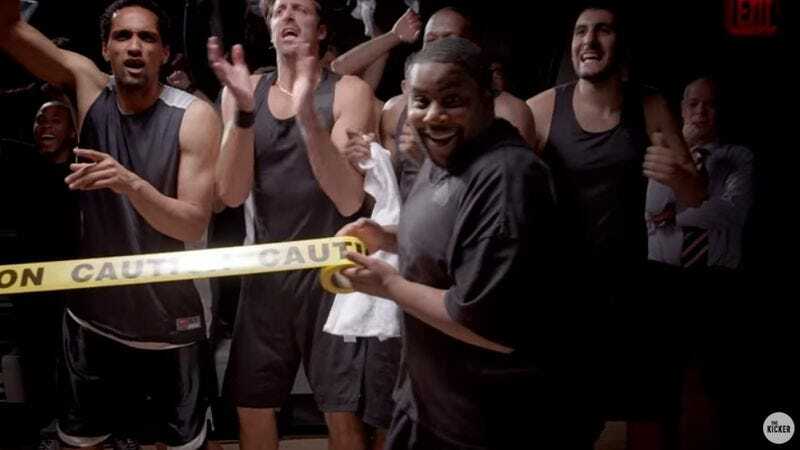 We’re here to be funny.” The site, which has recruited the services of such well-known funny people as Andy Samberg and “Weird Al” Yankovic toward this goal, is already off to an auspicious start with “Hold ’Em Back,” a modest but well-produced and funny music video featuring SNL veteran Kenan Thompson. As a comedic rapper, Thompson’s skills fall somewhere south of Samberg and somewhere north of, say, Arsenio Hall. But the song holds together nicely. In “Hold ’Em Back,” Thompson portrays a minimally talented NBA benchwarmer whose one and perhaps only professional responsibility is clear: When his team scores, don’t let the other benched players walk onto the court while celebrating. “I’m over here, waiting in the clutch,” go the lyrics, “making sure nobody doesn’t move too much.” And it’s a full-time job, too, as Thompson’s teammates will overreact to just about any bit of good news, including the announcement that the team is going out for ice cream after the game. He really gets into it, though, smiling broadly as he uses police caution tape, a stop sign, and airport runway lights to restrain his fellow players. “You worried that somebody’s gonna come on the court?” Thompson asks viewers. “Don’t even trip. I got this.” Good to know.